Aubree Marchione sponsored by Dress4Dance! Congratulations to Aubree Marchione and her wheelchair dance partner, Nick Scott, for their recent sponsorship from Dress4Dance! 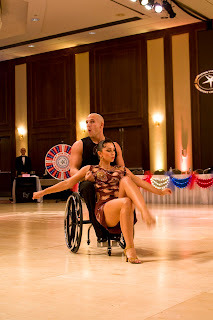 They will provide Latin costumes for the couple to represent the United States in the 2010 World Paralympic Dancesport Championships this November in Germany! Other sponsors of Aubree and Nick include U.S. Wheelchair Dance Association, Universal Dance Center, Dance Haddonfield, Crown Plaza, and the Starlite Ballroom. Above, Nick and Aubree perform at the Constitution State Challenge in Stamford, Connecticut. You can see more Dress4Dance costumes on the hit television shows, "Dancing with the Stars" and "So You Think You Can Dance", as well as on many ballroom and latin dance champions!